This set of Engineering Chemistry MCQs focuses on “Effect of Temperature on reaction rate”. Explanation: Temperature dependence of reaction rates can be studied by plotting a graph between rate constant and temperature for different reactions. 2. The ratio of the rate constant of a reaction at two temperatures differing by __________0C is called temperature coefficient of reaction. Explanation: The ratio of the rate constant of a reaction at two temperatures differing by 100C is called temperature coefficient of reaction. Explanation: According to Arrhenius equation, k = Ae-Ea/RT. So, rate constant(k) is proportional to e-E.
4. How does half life period of a first order reaction vary with temperature? Explanation: Half-life period of a first order reaction is directly proportional to the rate constant. So, it increases with increase in temperature. 5. How many times the rate of reaction increases at 200C for a reaction having the activation energies in the presence and absence of catalyst as 50 kJ/mol and 75 kJ/mol? Explanation: The rate of reaction will increase 28,592 times, i.e. 30,000 times. 6. Which of the following method is used to determine the order of the reaction in which two or more reactants take part? Explanation: Ostwald’s isolation method is used to determine the order of the reaction in which two or more reactants take part. Kinetic isolation conditions were identified that enabled determination of the reaction order for interfacial charge recombination. 7. Which of the following method is satisfactory only for simple homogeneous reaction? Explanation: Integration method is satisfactory only for simple homogeneous reaction and lead to wrong conclusion for complex reactions. Explanation: A zero order reaction is one in which rate is independent of reactants concentration. It only depends upon the rate constant. 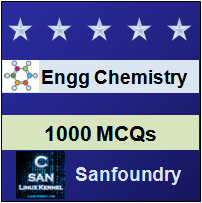 To practice MCQs on all areas of Engineering Chemistry, here is complete set of 1000+ Multiple Choice Questions and Answers.